A Good Investment. Marketing and entrepreneurship senior Danny Klam is investing in future generations of students in the Wolff Center for Entrepreneurship. As many students approach graduation, they are consumed with printing résumés, building portfolios and extreme job hunting. But for marketing and entrepreneurship senior Danny Klam, who already has a growing business, giving back to UH Bauer College tops his “to-do” list. Klam is a student in the Cyvia and Melvyn Wolff Center for Entrepreneurship, which was recently ranked the No. 1 undergraduate entrepreneurship program in the nation byThe Princeton Review and Entrepreneur magazine. The news of the ranking inspired him to commit to fund an annual scholarship for students in the program before beginning his application for graduation. 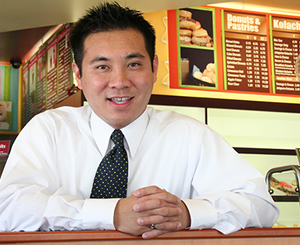 The scholarship will be in the name of the company Klam owns and operates with his cousin, Simply Splendid Donuts and Ice Cream. Klam will gift $1,200 dollars each year that will be awarded to a student during their first year in the WCE program. Klam plans for the scholarship to grow, but also hopes to have other scholarships or endowments in his name in years to come. For more information about Danny Klam’s scholarship and other scholarships available to UH Bauer students, contact Scholarship Program Coordinator Christine Abbott by phone at 713-743-6706 or email, cnabbott@uh.edu.